All are welcome to inquire about our Baptismal program at St. Vincent DePaul Parish. We do encourage you to register your family as parishioners and become active in our community. The Rite of Baptism includes these words, “The Christian community welcomes you with great joy.” And it is also with great joy that Saint Vincent de Paul Parish helps parents prepare for the baptism of their baby. 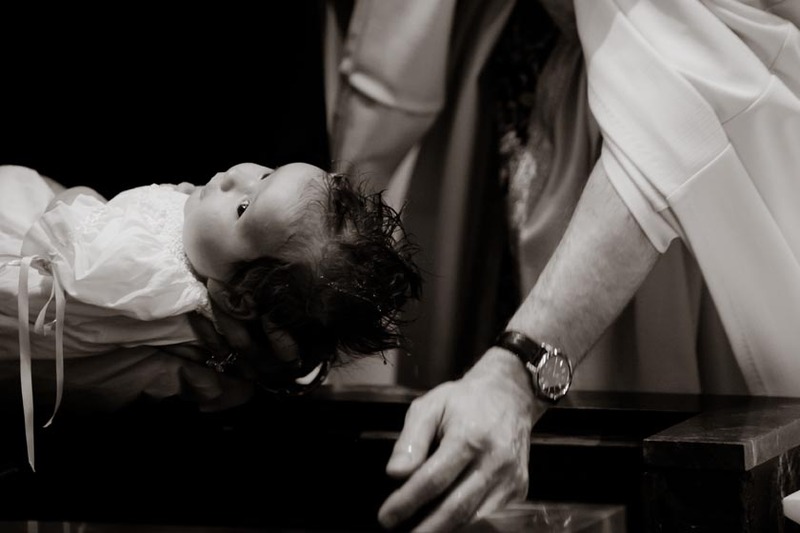 In bringing forward your child for baptism, you seek to make a permanent connection between your child and Christ with the Christian community. No matter how close or distant your own relationship with God, the new life of your child has stirred a desire in you to seek baptism for him or her. In this sacrament, the Christian community promises to walk beside you in nurturing the faith of your child. Please click for a list of Frequently Asked Questions about infant baptism. If this is your first time bringing a child forward for baptism, it is a requirement of the Archdiocese of Chicago that both parents participate in one baptism preparation session. Here at Saint Vincent de Paul, you may attend either before or after your child is born. The preparation session is held on the third Monday of each month at 7 pm in the Parish Center. Contact Mary Carter to check availability and to register for the session. We offer a few options for celebrating this first, most important sacrament. Group baptisms at Saint Vincent are celebrated at 11:30am on the 4th Sunday of the month, except during the season of Lent. This baptism rite is a beautiful ceremony with up to seven families bringing their children forward to be baptized. It lasts about 40 minutes and is not a full Mass. After a brief Liturgy of the Word and a short homily, the families and all their guests are called to gather around the baptismal font to witness the baptisms of their children. Another choice is to have your child baptized during one of our regular weekend liturgies. Baptisms may be celebrated during predetermined Masses on Saturdays and Sundays, depending on the liturgical schedule. We invite up to two children to be baptized at a Mass. You must confirm the date of the baptism with the parish before making further plans. Baptism dates do fill up quickly. To check availability, please contact Mary Carter. At what age are children usually baptized? What about single parents or parents who weren’t married in the church? What are the requirements for godparents? When will we receive the baptism certificate? Can we have the baptism celebrated in another church but do the preparation here? What happens during the preparation sessions? What should the baby wear for the baptism? Why doesn’t Saint Vincent baptize babies during Lent? For a child to be baptized in the Roman Catholic Church, there must be a basis for hope that the child will be raised in the Catholic faith. In practice, this generally means that at least one parent is Catholic. Many dioceses in the United States require parents to participate in some preparation before the baptism of their children; we offer a baptism preparation session here at Saint Vincent de Paul. Each child brought forward for baptism must also have at least one godparent who is a confirmed, practicing Catholic age 16 or older. There is no lower age limit, but at Saint Vincent de Paul, infants are generally baptized between three and six months old. We encourage parents to wait until they can experience the joy of this occasion without undue fatigue or stress. If your child is seven years or older, we welcome you and your child to baptism as well, although it is a different process. Please contact Mary Jo Polark for more information. Saint Vincent de Paul welcomes every parent to bring your child forward for baptism, no matter what your circumstances may be. Parents who were not married in the Roman Catholic Church might consider the possibility of having your marriage convalidated in the church; parish staff will gladly assist you in that process. It is not necessary for baptizing your child. We hope that parents choose godparents who will take an active role in the faith formation of their child. The Church requires at least one godparent who is a practicing, confirmed Catholic age 16 or older. That godparent’s name is entered into the parish record book as the “official” godparent or sponsor for baptism. If you choose two godparents, one must be female and the other one must be male. No more than two godparents can be registered as the official godparents in the baptism registry. Baptized non-Catholic Christians may not be “official” godparents for the record book, but they may be Christian witnesses for your child. If you choose a baptized non-Catholic Christian, the other godparent must be a practicing confirmed Catholic age 16 or older. People who are not baptized Christians cannot be sponsors for baptism, since they themselves are not baptized. However, you may certainly invite non-Christian friends or relatives to attend the celebration and to have a special place in your child’s life, sharing with your child their own faith traditions. Shortly after the baptism, we will send you one baptism certificate with the parents’ and godparents’ names, including the mother’s maiden name (as called for by church regulations). If your child ever needs a copy of the baptism certificate later, perhaps for school registration or for marriage, please contact the parish office. In order to support our Baptism Ministry, to cover administration and supply costs, we ask for a donation of $50 when celebrating your child’s Baptism at St. Vincent DePaul Church. Please send to or drop off at the Parish Center. This offering should be made out to St. Vincent DePaul Parish. That can certainly be done; it just calls for a little simple paperwork, primarily from the parish office. Be sure to check with the other parish for their requirements and contact Mary Jo Polark in the parish office. The sessions are designed to help you reflect spiritually on being new parents and how this great change has affected your own relationship with God. We also reflect together on the faith you desire for your child. It is a great way to meet other parents in the parish and to answer any questions you may have. We will discuss the theology of the sacrament of baptism, as well as practical aspects of the ceremony itself. A white garment is an ancient sign of the newly baptized Christian’s new life in Christ. Your child’s baptismal garment need not be a traditional baptismal or christening gown; it can be any clothing that is mainly white. (Regular department stores such as Macy’s and Kohl’s sell traditional baptismal gowns.) If the child will be baptized by immersion, the baby begins the ceremony in other clothes that are easy to remove and the white garment is put on the child after the water baptism. If the child will be baptized by infusion, that is, by pouring water from the font over the baby’s head, the child wears the white garment throughout the service. We are thrilled to have a big font that offers parents the option of having their child baptized by immersion, that is, by being bodily dipped into the life-giving waters of baptism. The baby’s head does not go under the water, and the water in the font is always fresh and warm. Babies baptized by immersion usually begin the baptism ceremony in clothes other than the white baptismal garment – something that’s easy to remove. As the moment for baptism draws near, the parents remove the baby’s clothes. After the baptism, the parents dress the child in the white baptismal garment. If parents choose not to have their child baptized by immersion, the baby wears the white garment throughout the service. We choose to fast from infant baptism during Lent as a way for the entire parish to live in solidarity with the adults who are preparing to be baptized at the Easter Vigil. Lent is a special time for adults who are preparing for baptism – it is called the Period of Purification and Enlightenment. By not celebrating any other baptisms during Lent, we wait in eager anticipation with them for the new life of the baptismal waters. In addition, our baptismal font is empty during Lent, with only a cross to remind us that it is through baptism that we unite ourselves to the cross of Christ.